This photo has nothing to do with the Dodgers, but it is magnificent nonetheless. 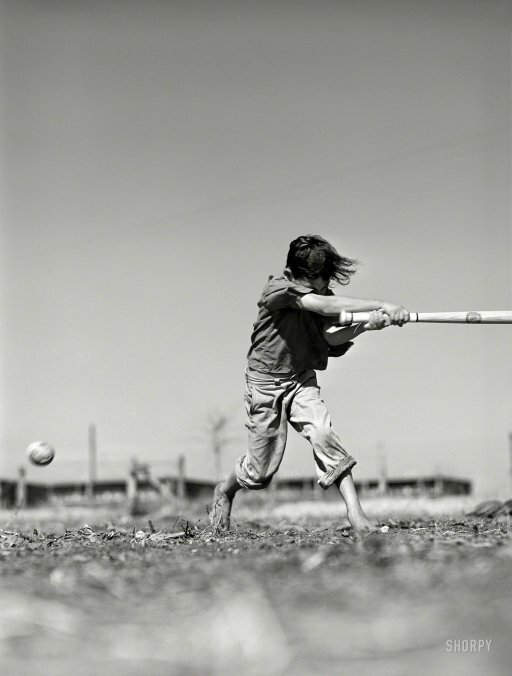 Featured is January 1942 photo by noted photojournalist Arthur Rothstein titled; "Saturday morning baseball game. Farm Security Administration camp in Robstown, Texas." It was shared by the Shorpy photo blog. This Day in Dodgers History: In 1990 Darryl Strawberry signed a five-year $22.25 million free agent contract to play for the Dodgers. Yesterday, the Dodgers front office held a press conference to discuss the immediate future. You can watch the entire thing here at SportsNet LA's facebook page, here. Per Michael Whittman at Dodgers Way; "Key Points from the Friedman-Zaidi Press Conference." This is terrible news. RIP, Roy Halladay. Per Benjamin Hoffman at the NY Times; "Roy Halladay, Former M.L.B. Pitcher, Dies in Plane Crash." Via Eric Stephen at True Blue LA; "Rick Honeycutt to return as Dodgers pitching coach in 2018." This is very welcome news. Both Seager and Puig are denied a Gold Glove. Per Cesar Becerra at Dodgers Way; "Two Gold Glove Finalist Come up Short." Via Matthew Moreno at Dodger Blue; "Rep. Jimmy Gomez Delivers Philippe’s French Dipped Sandwiches To Rep. Sheila Jackson As Part Of World Series Bet." “The excitement of this World Series is the reason why I have been a Dodgers fan since I played Little League as a kid. The Boys in Blue were on fire throughout the season, with both teams setting a World Series record for the most homers in a series. This past weekend one of my all-time favorite LA Kings players, Tiger Williams, was in town for a Legends Night celebration in his honor at the Staples Center, and he didn't disappoint. For those who do not know, Tiger is the NHL's All-Time leader in penalty minutes, so that should tell you a bit about what he did on the ice. But don't let that fool you. The fearless brawler could also score - recording 62 point during the 1980-81 season. Jon Rosen at the LA Kings Insider shares his recent interview with him that is worth checking out: "Catching Up with Tiger Williams on Legends Night." 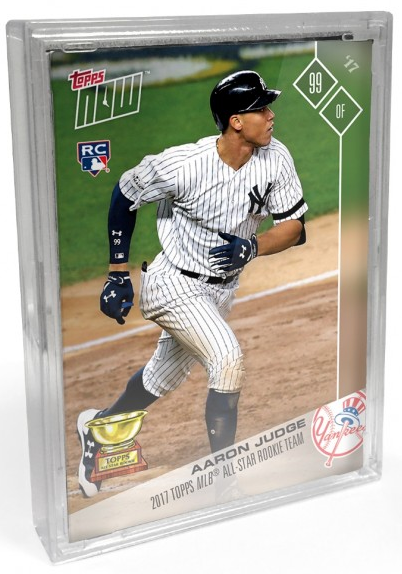 As I mentioned yesterday, Topps would be issuing a Topps Now All Star Rookie Team Set following their announcement of their All-Star Rookie Team. That set is now available for order over the next couple weeks. Check it out here ($39.99). All eleven ballplayers chosen are in the set; including Cody Bellinger. Unfortunately, we don't know what the Belli card will look like, but we do get a glimpse at the Aaron Judge card. See it on the right. As you can see, they use the Topps Now design for these cards. Also, an autographed version of the set is available, as well. This set includes all eleven cards plus one random card that will be autographed by one of the eleven rookie. Go here to check that out ($99.99). Tiger Williams is my all-time favorite King. Glad to know you liked him too! Old time hockey was the best! One of my other favorite Kings was Jay Wells -- unsurprisingly, a bit of a tough guy too. The Kings needed these guy to protect my other All-Time favorite Marcel Dionne - I'm still amazed that a guy so short could score so many goals.